Securities markets in the United States began with speculative trading in issues of the new government. In 1791, the country's first stock exchange was established in Philadelphia, the leading city in domestic and foreign trade. An exchange in New York was set up in 1792, when 24 merchants and brokers decided to charge commissions while acting as agents for other persons, and to give preference to each other in their negotiations. They did much of their trading under a tree at 68 Wall Street. Government securities formed the basis of the early trading. Stocks of banks and insurance companies added to the volume of transactions. The building of roads and canals brought more securities to the market. In 1817, the New York brokers decided to organize formally as the New York Stock and Exchange Board. Thereafter, the stock market grew with the industrialization of the country. In 1863, the New York Stock Exchange adopted its present name. During the Civil War, additional exchanges were organized, one of them the forerunner of the present American Stock Exchange, the second largest stock market in the country for a long time. Day Trading, as we know it, has been around for more than a century. Today, we have electronics to help, but the concept of buying and selling securities by the public goes back to the late years of the 19th century. Small businesses were set up in major cities across the country where people could go to make “plays” in the market. These were affectionately known as “bucket shops.” The players would all contribute money into the common “bucket.” The pool of money was then used as security for purchasing stocks or commodities with leverage. This enabled the small trader to speculate on otherwise “out of reach” stocks. The action in these shops was fast and furious. One clerk read the ticker tape while another clerk wrote prices on a chalkboard. 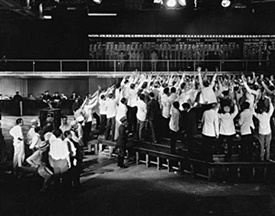 The speculators were able to quickly buy and sell the stocks as the “ticker” was read. Money was won or lost based on the inherent honesty of the shop operators. Needless to say, most were unlicensed and illegal. These shops died with the Stock Market Crash of 1929. After the crash, they were regulated out of existence. Our modern markets were re-created as strictly regulated exchanges in the 1930’s. Today’s major markets include The New York Stock Exchange (NYSE - the Big Board), American Stock Exchange (Amex- now part of the NASDAQ), Pacific Stock Exchange (PSE), Philadelphia Stock Exchange (PHLX), Chicago Board of Trade (CBOT), and the National Association of Securities Dealers Automated Quotation system (NASDAQ). The major foreign exchanges (and their respective Indexes) are located in Germany (DAX), France (CAC), Hong Kong (Hang Seng), Japan (Nikkei), and London (FTSE). Equity markets trade stocks (securities) while other exchanges specialize in bonds, commodities, futures, and options. A small exchange fee is paid to the exchange for each share that changes hands utilizing its services. A market is made when similar items are traded or exchanged. Our exchanges of today have their roots in the agricultural marketplaces. Farmers’ markets and coastal city fish markets still exist throughout the country. These marketplaces have given way to retail sales, but not long ago they still traded goods back and forth. The 1929 Crash and the following Great Depression changed our way of doing business entirely. As noted above, the Security and Exchange Commission (SEC) instituted sweeping regulations to ensure that another crash would not happen. Congress established this U.S. regulatory commission in 1934, after the Senate Committee on Banking and Currency investigated the New York Stock Exchange's operations. The commission's purpose was to restore investor confidence by ending misleading sales practices and stock manipulations that led to the collapse of the stock market in 1929. It prohibited the buying of stock without adequate funds to pay for it, provided for the registration and supervision of securities markets and stockbrokers, established rules for solicitation of proxies, and prevented unfair use of non-public information in stock trading. It also stipulated that a company offering securities make full public disclosure of all relevant information. The commission also acts as adviser to the court in corporate bankruptcy cases. In 1971, the National Association of Securities Dealers (NASD) created a fully integrated, computerized trading system called the NASDAQ (National Association of Securities Dealers Automated Quotation system). This allowed NASD members to post competing bids and offers for a variety of stocks. Thus, the electronic “Over the Counter” (OTC) market was created. This was a major departure from the “auction” markets of old (NYSE, AMEX, etc), with their Specialists. OTC market trading does not take place on physical stock exchanges; such trading is most significant in the United States, where requirements for listing stocks on the exchanges are quite strict. It is often called the "off-board market," and sometimes the "unlisted market," though the latter term is misleading because some securities so traded are listed on an exchange. OTC trading was most often accomplished by telephone, telegraph, or leased private wire. Now the computers, with either Internet access or direct electronic connections are taking over this route of trading. In this market, dealers frequently buy and sell for their own account and, usually, specialize in certain issues. Schedules of fees for buying and selling securities are not fixed, and dealers derive their profits from the markup of their selling price over the price they paid. The investor may buy directly from a dealer willing to sell stocks that he owns or with a broker who will search the market for the best price. A third market has developed because of the increased importance of institutional investors, such as the mutual funds, who deal in large blocks of stock. Trading is done in shares listed on the exchanges but takes place over the counter (OTC); this permits large-quantity discounts not possible on the exchanges, where brokerage fees are fixed. Much of the regulation of the OTC market is affected through the NASD, created in 1939, by an act of Congress to establish rules of conduct and protect members and investors from abuses. Although retail prices of OTC transactions are not publicly reported, the NASD began publishing inter-dealer prices for the issues on its national list in February 1965. NASDAQ, created by the NASD in 1971, is an automated quotation system that reports on trading of domestic securities not listed on the regular stock markets. The NASDAQ is a subsidiary of the National Association of Securities Dealers (NASD) and is monitored by the Securities and Exchange Commission (SEC). By opening the NASDAQ system to direct execution by the public, traders were able to increase competition, which has lowered the spread (the difference between the bid price and the ask) on many NASDAQ listed stocks. By the 1990’s, it had grown into the second largest securities market in the United States and the third largest in the world. In 1992, it was linked to the International Stock Exchange in London, forming the first intercontinental linkage of markets. NASDAQ lists more than 5,000 securities. To be a member, a company must register with the SEC, and have at least two market makers; a market maker is a brokerage firm that acts as a principal on either side of an OTC transaction. They have the right to set the prices at which they are willing to sell and purchase the security. Those prices do not have to be at the current market prices. Market makers frequently make markets in multiple securities, and meet minimum requirements for assets, capital, public shares, and shareholders. It publishes two composite price indexes daily and also bank, insurance, other finances, transportation, utilities, and industrial indexes. As usual, there were “ups “and “downs” over the intervening years until the October 19 collapse of the market in 1987. This downturn was seen, at that time, as a terrible crash. History and hindsight shows a resilient market that bounced back and continued a Bull Run after a few months. That October in 1987, when the market was falling, there were enough brokers that didn’t answer their phones that the SEC implemented a new regulation that required market makers to buy a certain amount of stocks from small investors when the small investors want to sell. The SEC also formed rules that would eventually allow individual investors to buy and sell shares by connecting directly to the markets and make it mandatory for the market makers to handle the transactions. Over the next couple of years, these changes resulted in the updated Small Order Execution System (SOES). SOES was the conduit for the individual investor to escape through. It is this system that allowed the world of “electronic” day traders to start. The next step was the creation of the first Electronic Communication Network (ECN) by the NASDAQ market. It was named Instinet (INCA) and was owned by Reuters. This ECN was originally designed for use by the institutional market and allowed market makers to trade anonymously. It did not take long for the re-emerging day traders to discover the uses of the automatic execution system of the SOES and the growing ECN network. In the 1990’s, we saw the creation of Island, Attain, RediBook, Bloomberg Trade Book and other ECNs. Eventually, the SEC and NASD realized that this platform of trading had to be open to all, not just market makers. The market makers dubbed these new direct electronic traders as “SOES Bandits” because of their quick hits and fast trades. It was a misnomer though, as the “Bandits” did not take from the system as much as they gave. The NASDAQ, SOES and the ECN groups grew very quickly in the early 1990’s. The day traders provided liquidity in the OTC market that was never seen before. Their ability to set their own prices and live off of their trading further reduced the price of brokerage commissions and narrowed the, heretofore, very profitable spread. Currently, there are several ECNs operating in conjunction with the NASDAQ. Day trading firms have sprung up across the country and even internationally. With direct electronic access, speed of light execution, and availability of ECNs, electronic day trading is here to stay. It is no less risky than the bucket shops of old, but it has become a legitimate, regulated and organized profession worthy of competing with the age-old trading houses.